The Rising Sun artwork is a three-dimensional sculpture consisting of twenty eight lead crystal rays. 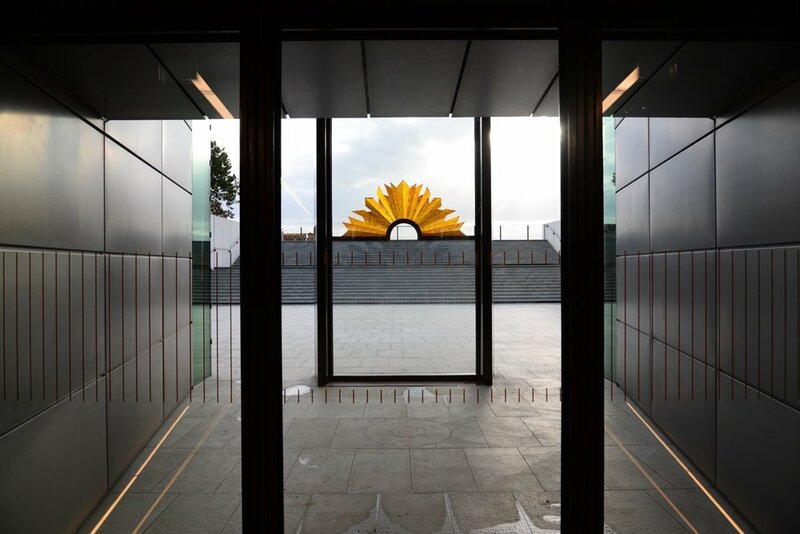 Each ray has been cast individually to create angular forms inspired by swords and bayonets, the original inspiration for the ANZAC badge, and Sir Edwin Lutyensʼ interpretation of the Rising Sun emblem that frames the entrance to the Australian National Memorial. The sculpture sits on a bronze-plated stainless steel rail suspended in the middle of a four metre high bronze totem, with each glass ray resting against the next. The curved rail supports the arch of the glass sculpture so that the viewer sees the Rising Sun artwork resting on the horizon. The hand of the maker is evident in the textures and brush strokes of her tools on the surface of the cast glass, evoking the shell-pitted terrain and shattered buildings on which the Battle of Villers-Bretonneux was fought. These details also serve to remind the viewer of the human sacrifice of war. Graduating shades of amber mimic the glow of the rising sun. Sitting side by side, the rays can be seen through one another, creating depth and shadows. From the courtyard outside, the artwork is dark and sombre, reminiscent of stained glass windows as seen from the exterior of a cathedral. Yet as one approaches from inside the Centre the highly polished side glows with all the natural light behind it. These three-dimensional rays capture and reflect both that light and the mud of the trenches. The artwork acts as a focal point and beacon for the viewer leaving the moving and harrowing experience inside. The Rising Sun Sculpture was commissioned for the Sir John Monash Centre which sits behind the Australian National Memorial in Villers- Bretonneux, Somme, France. Designed by Cox Architects with Williams, Abrahams and Lampros the Centre has been dug into the earth to resemble a war time bunker and not overshadow the existing memorial. The original memorial was designed by Sir Edwin Lutyens in 1935 to commemorate the 300,000 Australians that served and the 46,000 that lost their lives on the Western Front in World War I. The new Centre has been built to commemorate the Centenary of the end of this war. The Centre is a museum and interpretive research centre that commemorates the Australian Servicemen and woman who served on the Western Front during the First World War. It was officially opened on the 24th of April 2018 by the Australian Prime Minister Malcolm Turnbull. Through interactive media installations the centre tells the story of Australia before the war, why we went to war, what we achieved and how being involved in the War changed Australia. 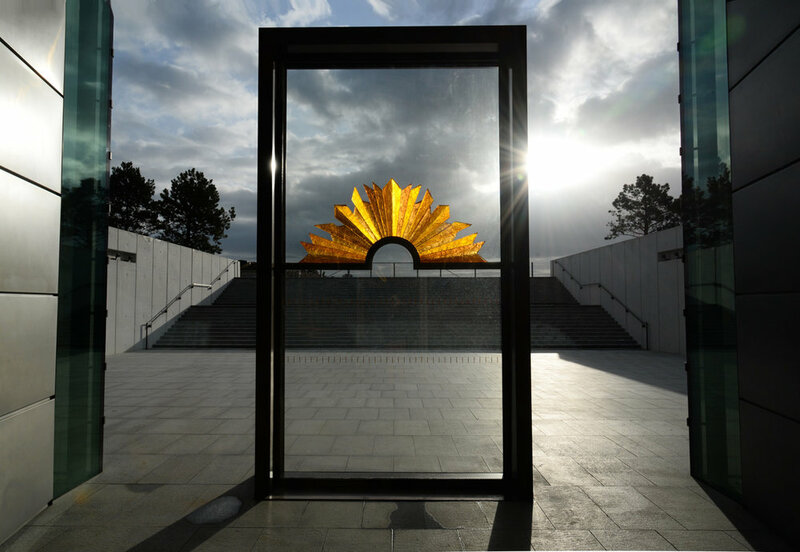 Commissioned by the Department of Veterans Affairs through the Canberra Glassworks the Rising sun sculpture is is 90cm high, 2 metres wide and 8cm deep and weighs 160 kilos. It sits on a bronze plated Stainless steel bar inside a 4 metre high Bronze Totem as you exit the Centre.